When I learned that the average American does not wear 75% of what is in their closet, I saw a perfect opportunity to give the environment a break. Instead of plundering nature of its virgin natural resources, we take surplus clothing right from our clients’ closets and give them what I call ‘a Jussara Lee special hand twist’ — visible mending. I recently launched ‘Hand Me Up’, a thrift shop concept designed to inspire people to rethink their consumer habits — and to start mending their clothes artfully. Did you know that most donated clothes don’t wind up serving the needy? This is what happens to a lot of clothes that are donated to typical thrift shops. We need to look at fashion differently — we can reverse the wasteful cycle with visible mending. Following are some ideas. The throwaway culture surrounding fast fashion fuels a decadent industry that has no respect for human rights and the treatment of workers, let alone the environment. Let’s expose the true facts of how cheap clothes are made so that consumers will opt out of fast fashion, and instead resort to alternatives that will mend our broken sense of connectedness with our belongings’. 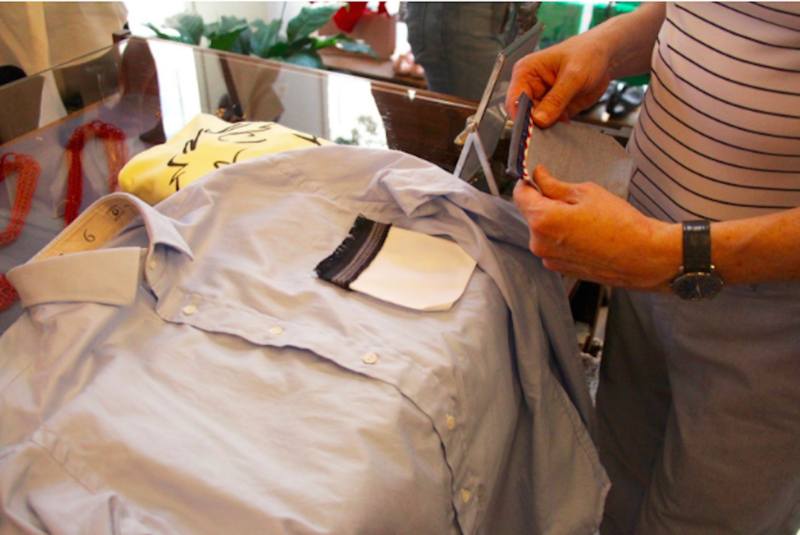 Mending encourages the expansion of lastingness, and it is also a fun way to fight waste. My ‘Hand Me Up’ thrift shop concept is a creative proposition on how to tackle pollution while giving touches of hand-mended stitching. 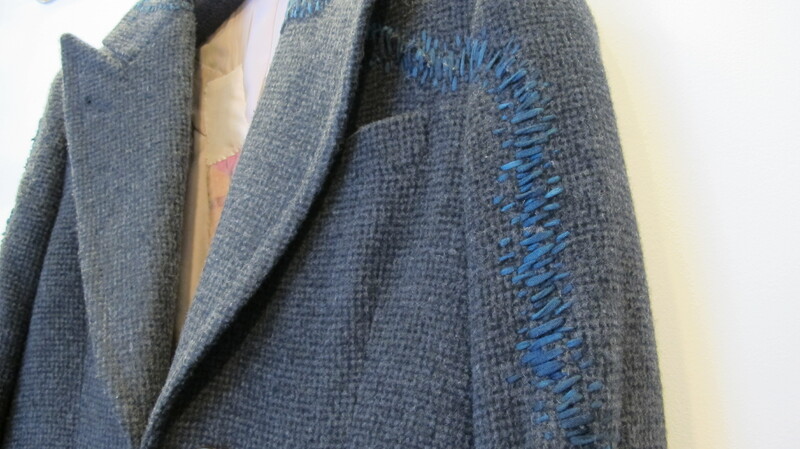 Instead of trying to hide a tear, my process of visibly mending the clothing by hand has been extremely fulfilling as I discovered that it can miraculously transport undesirable clothes to a coveted state, giving them a new life and a new body to clad. Sustainable options can be expensive, but mending and repairing are easy ways to use less virgin resources as well as to save money. I am constantly encouraging everyone to wear their clothes until they are threadbare. My closet is small and most of my clothes are old, but this demonstrates that this ethos works because when things are made well, they age beautifully and people never seem to notice their fraying edges. I have found that, contrary to this belief, I am actually always getting compliments! And unlike many people who reply to a compliment with a boast about how little they paid for the item being contemplated, I boast about its age. To extend these perks to others, I offer maintenance and alteration service so that their clothing may also endure the brunt of time gracefully. If one’s weight fluctuates, a hem gets undone, or the lining of a beloved jacket or coat wears out, I give the piece some tender love and care to prepare it for another round of excitement. All this might sound conflicting considering I am a fashion designer. But I have reached a point of equanimity, where I make as few clothes as possible, yet I am still able to thrive. The message is simple: less is better, quality is essential, and true beauty is in how things are made. I myself tend to boast about clothes that I acquire cheaply, but I love how Jussara finds pride in the age of her clothing! I feel the urge now to go through my closet purposely looking for items that could use some TLc! Thanks for sharing this story. Fantastic article! As someone who has developed a “quality over quantity” attitude but still has cheaply made clothing, this has sparked a solution in my mind for the items which have worn out. Thank you for furthering the discussion on re-purposing clothing and sustainable fashion alternatives. I’ve recently been trying to buy sustainably produced clothing, but haven’t known what to think about the clothes that I’m replacing or the fact that the new clothes, even if they are from a sustainable retailer, are still made from fresh resources. This is an inspiring way to make old clothes useable again, and to call attention to a sustainable fashion mentality! This is a great article. We often repair clothes in my home as well or pass them down the line of siblings. The fast fashion that is common of the time creates such a huge environmental impact all the way from the production of the clothes to the end of their life. I wear clothes till they get too torn up, or get too small, and also generally avoid unsustainable clothing stores when shopping. This is inspiring. We all need to get more creative, thankful and respectful. I’d love to see workshops on clothing mending and detailing. Thank you for your creativity and inspiration Jussara. Oh my… this is awesome. Hi everyone! We are launching our Hand Me Up Pop Up Event for Spring! Jussara Lee’s design approach is to reuse and improve on existing garments instead of producing collection after collection. The event will happen this Tuesday April 24 from 2-7pm at 60 Bedford St. New York, NY. My favorite quote from this article is Jussara’s statement that “less is better, quality is essential, and true beauty is in how things are made”. This has critical environmental implications from the food we eat to what we wear. As New Yorkers living in a fast-paced consumer hub, I wish more people believed in this quote & supported sustainable, ethical fashion! Fashion absolutely does thrive on a throwaway cultures — and thrift shops often pick up on this, overcharging for clothes so that only some economic classes are allowed to participate in the circulation of fashion. I will not pretend like this shop’s idea does not have a similar economic effect; nonetheless, I love the idea presented here because it references the ethics of clothing production. This store, by slowing the throwaway culture cycle, also works to stop the cycle of buying clothing that is made illegally or with child labor or labor trafficking. I find this article so inspirational. 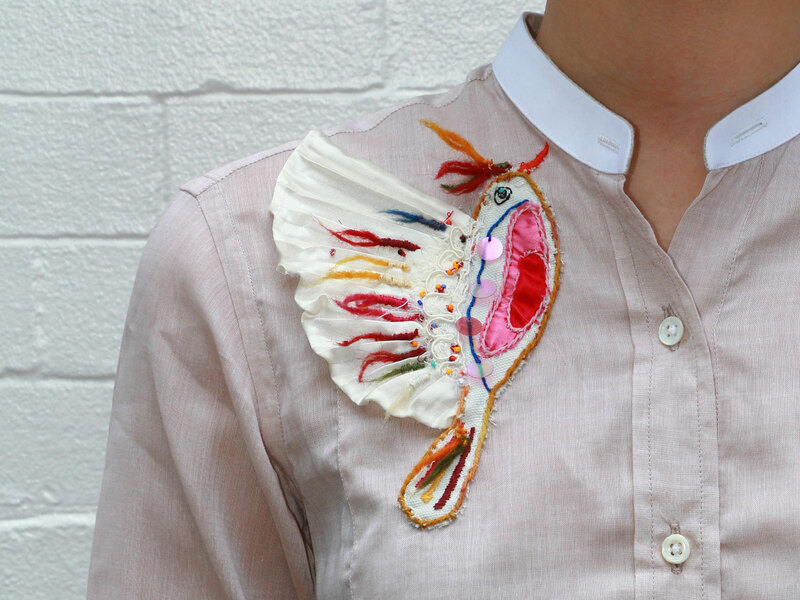 To wear clothes that you have mended yourself is an incredible and sustainable form of self-expression. Engaging physically with the things you wear adds a wonderful personalization and identity to your clothes. However, we battle a culture that has a sense of perceived obsolescence in regards to clothing. Many people go out to shop for clothes as a fun activity. How to we battle this culture? How do we show people the beauty in owning the same clothes for years and years? These are questions I’ve struggled with for years. I wholeheartedly agree with the article in which we should be promoting a sustainable ethos in consumer culture. Our consumer society has single-handedly created so many environmental issues- from increasing waste to the depletion of natural resources. I’ve seen stuff like this where people talk about how inspiring a project is but move on with their lives right after. I think the question we need to ask ourselves is how can we make this a movement instead of a mere project? I love the quote “less is better, quality is essential, and true beauty is in how things are made,” and I believe that this can not only be applied to fashion, but to essentially everything we buy. It seems that over the years items have been built more cheaply so that they won’t last as long and people will have to keep buying things. This is just an unsustainable way of doing things and as consumers it is up to us to be responsible, environmentally conscious shoppers. We need to be hyper aware of how our actions might indirectly be supporting the type of system that stays in power. In fact, we should steer away from the word “consumer” entirely, and make the shift to shopping as informed citizens. The question then arises of how we can motivate people to sacrifice cheapness and convenience for the sake of the greater good. It is so true that quality is key when it comes to fashion! I love the idea of visibly mending something to reduce our impact on natural resources and I’m happy to see so many other people here in the comments love the idea too. This is a great way to reduce and reuse and its also an amazing creative outlet. I am going to look through my closet! Thanks for the great tips! What an inspiring post. You allowed me to rethink what fashion really means to people… It could sometimes be the empowering tool that boosts up one’s confidence, yet could also be the invisible matter that pushes people to be wasteful as they think they are not “on trend”. And it’s time to clear all those narrow perceptions like showing mending as odd and “not cool”. It’s always a great idea to mingle environmental awareness and waste reduction with art! I love the concept of taking what one already owns and repurposing it in order to get real use out of it. As someone with basic sewing skills I can mend a hole or tear in my clothing but I do not think I would have the skills to completely transform an article of clothing. I am curious – are there any classes or workshops that teach people interested in recycling their clothes the skills to do so? Shopping for clothing, especially fast fashion is seen by many as an activity or outing. Giving people the skills to recycle their clothing on their own would allow them to possibly replace some of the time they spend shopping for fast fashion with another activity that that is both fun and sustainable.